Starts 10.00am and ends 4.00pm. Location: Merthyr Mawr Estate, Bridgend, South Wales. Courses detail: This package is designed for corporate businesses as a team building exercise, through the medium of bushcraft. 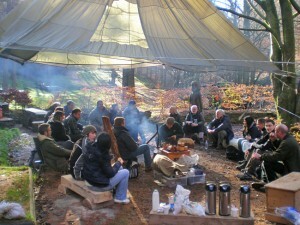 The exercises are designed to bring a team of clients together in a survival situation within a woodland environment. Imagine yourself on a business trip with fellow employees, Destination Canada! Your sitting back enjoying the view, glass of wine in hand, deep in conversation. Eight hours into your journey both the engines fail, suddenly the pilot gives all passages a chilling message the plane is going crash land. The situation is critical, you hear a large bang and you feel the wind ripping through the fuselage, hours later. You feel someone trying to wake you. You’re still alive along with some of your colleagues!! This is the beginning will you survive the challenge? All courses include comprehensive insurance. Discount is available for large or small groups and family bookings. We can design and deliver a wide range of courses to meet specific requirements – tailor made courses can be organised on request.